As you can see it’s up above 7.50% (barely, but I’ll take it). It’s a good move in such a short time. I’m not entirely sure what to attribute the move to, but I have been using Lending Club’s automatic investing feature. I let them pick my loans on criteria that I choose. My criteria is extremely simple: loans that are grade D or lower with credit scores above 700. I’m sure that this isn’t the most efficient criteria, but it does the job. It tends to keep payments from other loans reinvested… except that every now and then I log in and see that I have a bunch of money available cash. For example, in the image above I have $100 just sitting there waiting for loans. I was able to find more than enough qualifying loans available. I’m not sure what’s up, but I’m guessing it’s human error on my part (I’m missing some tiny detail). In any case, the “set it and forget it” method has worked reasonably well. There’s another detail in the image above that may be easy to overlook. I’ve received $12,500+ in payments over the years in Lending Club. I sometimes here that it’s risky because P2P lending is new, but my loans have now rolled over a couple of times. With more than 200 active loans, it’s got some good diversification. The poop may hit the fan with the economy and change all this, but it hasn’t happened yet. And if the economy takes a big hit as in that scenario, your stocks may lose even more. I look at Lending Club as something that is differently correlated to my other investments (stocks, real estate), which is valuable to me. I would love to have more money in Lending Club, but saving in retirement accounts is about the most I can do at this point. If you agree, sign up for Lending Club today and start earning a healthy interest rate on your money. Every few months, I do a net worth review. As I was doing the latest one, I got to my Lending Club account and realized it had been a long time since I’ve written a Lending Club update. I hadn’t no idea how long it had been. The high/”perfect” rate of return is 7.83%. 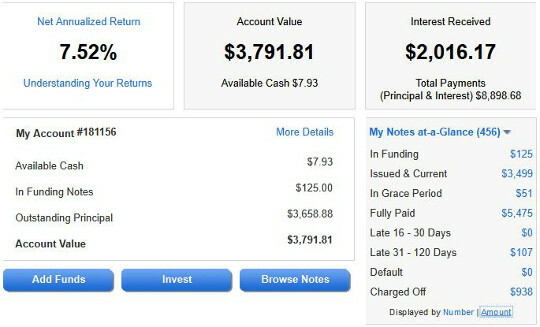 The likely/”average” rate of return is 7.18% (pictured above). 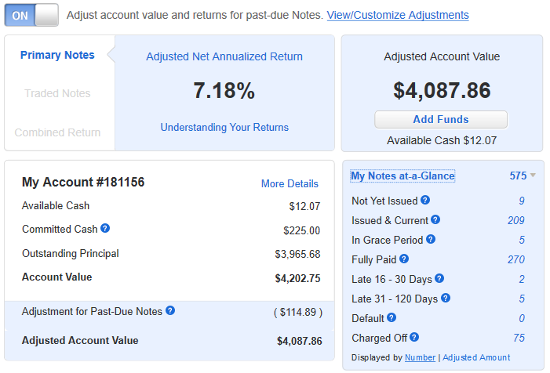 It looks safe to say that I’m getting a 7%+ return in Lending Club. I think that’s great considering interest rates elsewhere and the consistency I’ve seen in the account over the years. 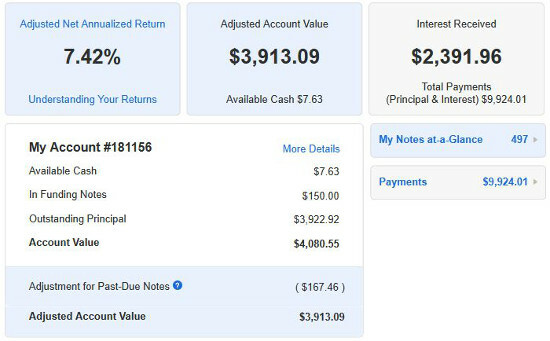 Investing in the stock market can have some wild swings, but the growth in my Lending Club account is slow and steady. The 200 loans I have seems to eliminate the ups and downs. Don’t believe me? Here are many of the reviews of my Lending Club account over the years. Years of data, consistent gains, a generous 7% return… I think these things could be valuable in any portfolio. If you agree, sign up for Lending Club today and start earning a health interest rate on your money. As regular readers know, I’ve been posting my Lending Club updates for years now. 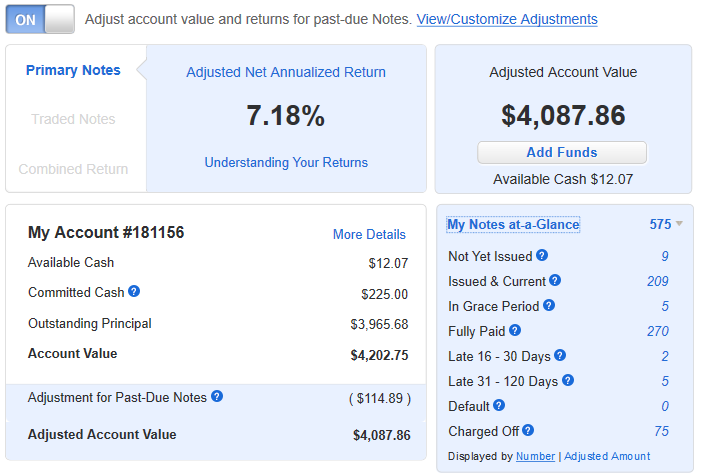 At the start of 2011, I was making a 4.78% return on my ultra conservative loans. I started to mix in more risk and it moved up to 5.90% by March and 6.42% by May. Three years later, I gave my last Lending Club Update (May 2014) and it was 8.10%. The difference is that I’ve been investing in the E, F, and G grade loans that have a historically better performance. Bam! Who else is giving you 8.54% nowadays? No one. The two charts are the result of Lending Club creating a new tool to customize your view. As you might have gathered from the captions, the first one is an “ideal” situation where all the deadbeat borrowers nice people with financial difficulties make good on their loans. This has been what Lending Club has been showing people for years. Thus in order to do an apples to apples comparison with my numbers in the past, this number is useful. By that metric, I’m almost doing a half percent better than what I was doing a few months ago. The second chart, looks at the loans that are late, and calculates their “value” based on historical default rates of other, similar late loans. I consider this a more realistic, accurate view. And while there is a big difference between 8.5% and 7.4%, it is much, much better than many other markets. [Update: Actually it seems that they had the tool back in my last update and my “realistic” view was 7.02%. So in an apples to apples comparison there, I’m doing almost a half percent better in a few months. I know that it isn’t the best comparison, but I find it difficult not to look at CDs. This table shows a return of around 2.3% for a 5 year CD. That’s guaranteed, which is very valuable to some people in certain situations. However, over the last five years that I’ve been investing in Lending Club loans, I’ve amassed nearly 200 loans and that diversification gives me what I believe to be a 99% or better guarantee of at doing double the 5-year CD rate and a reasonable chance of doing triple… without locking my money up as long. It all depends on what your risk/reward tolerance is, but I think a strong case can be made for investing in Lending Club to smooth out the stock market’s wild ride while providing you better interest (without much more risk) than CDs. A few months ago, I wrote a detailed article covering years of my investing in Lending Club. I estimated that I earned 7% Interest there. It’s an estimation because of numerous things that make an exact calculation difficult. I wrote many of those things in this somewhat complex article. Fortunately it’s easy enough to get a fairly good range. In fact, Lending Club gives us tools to do exactly that. The image below shows that I am earning an annualized 8.10%. It presumes all those late people are going to suddenly start paying. While that’s an unlikely scenario, it is a good upper bound. Using Lending Clubs tool, I presumed all the late people will default. While the worst case scenario is that the people with current loans default, this is a reasonably very, very bad scenario. The result of this assumption would be an annualized return of 7.02%. Lending Club has a lot of data of what default rates are, and they give you this information so you can predict what might be a most likely scenario. Using those numbers, my return would be 7.61%. I have more than 200 active loans and I’ve been lending for years now. (The 478 number that you see in the image above includes loans that have been fully paid off and defaulted ones that were charged off). This large number of loans over a long time gives me a high degree of confidence in the returns. In fact, I am more confident in Lending Club returns than I am in any of my diversified ETFs. I certainly couldn’t tell you that the S&P 500 is likely to return between 7-8% this year. In fact, I would confidently bet on it returning some amount outside that range. CDs guaranteeing around 2.3% annually over 5 years. It occurred to me that it has been some time since I’ve updated people on my Lending Club lending. I’ve been Lending Club for years and years now… and typing that sentence makes me feel really old. So that $3045.10 of account value in May of 2011 is now nearly $3800! 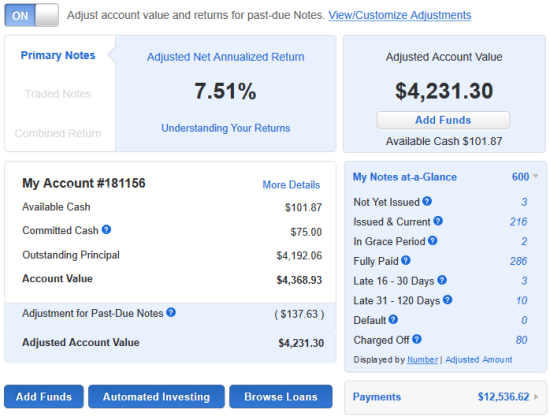 I’ve added no new money, just reinvested the payments of previous loans and let it snowball. That’s around ~$750 on $3045 of principle in about 39 months. (Look at me getting all mathy). I found a calculator online and that rate of return comes out to about 6.75%. That’s different than the amount that Lending Club shows in the image, but their calculation is over the entire time I’ve had the account (and is undoubtedly more complex). In a world where banks are paying fractions of a percent, this is much better. (Especially when they pound their chests at giving “three times the nation average”, which amounts to fractions of a percentage point.) Of course, this there’s risk with Lending Club and it isn’t like a bank account at all. I think that risk is minimal since I’ve had 456 notes, a significant sample size by almost any measure. The thing that I like most about Lending Club is that I can see myself using my Lending Club account as a source of income in 30 years when I’m 67. Doing the math and compounding this interest, it will be $21,289 at that point. The cost of living will be more… and it’s not like $21,289 will sustain me for years, but it’s enough to take $200 a month out for years. That will hopefully cover some bills, which isn’t bad considering that I just put money in once. These small decisions add up. Get started at Lending Club today.